The Urban Politico: May The Best Candidate (That Money Can Buy) Win! The MSM often skips these kind of news stories but we figured you might wanna know about this one. The Supreme Court of the United States just ruled on the Hillary: The Movie case; it was the case where a conservative company back in 2008 (Citizens United) created a 90-minute documentary that it wanted to show on-demand attacking then-Senator Hillary Clinton just before the Democratic Primary. Today, the Court ruled in Citizens United v. Federal Election Commission, 558 U.S. ____ (2010) that CORPORATIONS have a Constitutionally protected First Amendment right to Free Speech and are free to exercise that right by using their corporate bank accounts to buy as many campaign ads/videos/etc. as they want for (or against) political candidates. Now if that sounds a little odd to you then it's probably because it is. In a country where we can't even make up our mind as to whether human beings suspected of crimes are eligible to have Constitutional rights, it seems a bit disingenuous that we would freely apply Constitutional rights to a corporate entity that exists only on paper, completely devoid of any body, mind, soul, or mouth with which it could use to express its so-called "freedom of speech" rights. As we mentioned earlier, this all started back in 2008 when Citizens United, a conservative non-profit corporation, created a 90-minute documentary right before the Democratic Primary urging voters not to vote for Hillary Clinton. It wanted to distribute this movie through cable TV's video-on-demand feature. However, there are Federal Laws in place (at least there were before today) that regulate corportions from spending money when it comes to political elections. One such law was the Bipartisan Campaign Reform Act of 2002, also known as the McCain–Feingold Act, named after the two senators that proposed it, John McCain (R-AZ) and Russell Feingold (D-WI). In a nut shell, the Act prohibited corporations or unions from using their money to (1) make direct contributions to political candidates, or (2) advocate the election or defeat of a political candidate through any form of media. The Act also requires corporations or unions to place disclaimers on whatever political ads they make. Citizens United argued that it should be able to show the Hillary movie on-demand (complete without disclaimers) because it has a right to free speech. The Federal Election Commission (FEC) argued "yeah right, you wish." The two battled it out in the D.C. federal District Court, and the FEC won. Citizens United appealed to the Supreme Court and here we are. The Majority Opinion of the Court was written by Justice Kennedy (the "swing voter") and he is joined by Chief Justice Roberts (yes, the dude who messed up Obama's Oath of Office), Justice Scalia, and Justice Alito in full, and he is joined in part by Justice Clarence "Uncle" Thomas because Thomas is so conservative he couldn't, in good conscience, co-sign to Part IV of the Majority Opinion. Part IV, and only Part IV, of the Majority Opinion is joined by Justice Stevens, Justice Ginsburg, Justice Breyer, and the newbie Justice Sotomayor. So for those playing along at home, that technically means that Kennedy got all 9 Justices to join his opinion (at least in part). No Dissenting Opinion was filed but there were a few concur & dissents filed by Stevens and Thomas, and also a few concurring opinions filed by Roberts and Scalia. Many people think that we have a 100% absolute right to free speech in this country, but that's actually not the case. Over the years, the Supreme Court has interpreted the First Amendment to allow our government to regulate (but not prevent) our freedom of speech rights when they involve words or expressions that may be harmful to society. 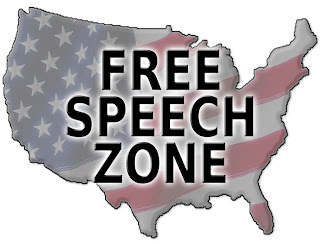 Whenever the government makes a law that regulates free speech, that law receives what the Court calls the "Strict Scrutiny Test," which means that the law had better be the most narrowly tailored and non-obtrusive law possible when regulating our free speech or else it will get knocked off the books as unconstitutional. Justice Kennedy (no relation to the Kennedys BTW) spends the first 3 parts of his Majority Opinion convincing us that there are no narrowly tailored ways to apply the bulk of the McCain–Feingold Act or Thurgood's Austin case to this issue of regulating corporate free speech, so by his view, both the bulk of the Act and the Austin case are voted off the island. "We find no constitutional impediment to the application of [the Act's] disclaimer and disclosure requirements to a movie broadcast via video-on-demand. And there has been no showing that, as applied in this case, these requirements would impose a chill on speech or expression." Citizens United, No. 08-205 at 55-56. Pimp-slapped the McCain–Feingold Act down to a mere disclaimer provision, which now gives corporations and unions the right to exercise their free speech during political elections...so long as they put a 4 second disclaimer at the beginning. What comes next is anybody's guess, but it doesn't take much imagination to connect the dots here. If you were a Wall Street corporation with virtually unlimited financial resources and a political agenda against a president who wants to regulate you for the good of the people, what would you do in 2010 and 2012? Since everybody seems to be in agreement that this is a ridiculous decision, let me challenge you all by playing devil's advocate just a bit. Justice Scalia, in his concurring opinion, says that of course corporations have free speech because corporations are merely groups of people coming together. So if they have a right to speak, the corporation has a right to speak, right? "I join the opinion of the court. I write separately to address Justice Stevens' discussion of "Original Understandings." [citations omitted] This section of the dissent purports to show that today's decision is not supported by the original understanding of the First Amendment. The dissent attempts this demonstration, however, in splendid isolation from the text of the First Amendment. It never shows why "the freedom of speech" that was the right of Englishmen did not include the freedom to speak in association with other individuals, including association in the corporate form."